How can any of this stuff do anything. The draws are completely random. One number could be drawn once a week, another only once a month, and another only once a year. It is totally up to chance. The only way to increase your odds is to buy astronomic amounts of tickets. Scratch offs are my weakness. Well exactly. I can’t say it enough that it’s impossible to predict numbers, yet some new pile of garbage prediction system appears almost every week! People want to believe so there will always be someone willing to stoop low enough to sell it to them. It does pay however to step back and look at your overall strategy. Are you playing the right game, are you playing too many games or too often etc. That’s the kind of help you’ll get from my free lottery tips. And it doesn’t take astronomic tickets quantities just to get a better chance – if you normally buy one ticket but instead buy two, that doubles your chances. Which is why lottery syndicates make sense. I really want to win the lottery and most of the bull I read about only wants my money. I hope that you can give me some insight. Sure can – start with my free tips to win the lottery. Far better than most of the BS you’ll pay $50+ for. Yes, you have been very helpful. But tell me more about the lottery system by Mark Callard (ebook and software)? To all the fools among fools out there in lottery systems land. Steve Player has just mailed out some fresh horse manure right out of a horses rear. It’s called the two step system for play 3 and play 4, you could win as much as $80,000. The Pick 3 system will cost you $195. The Pick 4 system will cost you $395. And if you can’t wait rush shipping is only $15 more. If you buy both systems it’s a bargain at $495. Step 1. You open your wallet and begin counting $495. Step 2. you send the $495 to Steve Player. In case you’re wondering if there’s a step 3, you can stop wondering, there is. When you reach step 3 you end up with a bunch of losing lottery tickets, and a wallet that has lost weight by $495. With no refund available, and left standing with an open mouth wondering what happened. You soon realize that you have joined the exclusive club of fools among fools. A club that is so exclusive it even has it’s own motto – “fools and their money are soon parted”. I took the Inverted System by Stefan van Der Velde and converted “Honest” Ken Silvers numbers to see which panels could win. And low and behold I just proved that Honest Ken was in fact not so honest. His 120 numbers made no sense and would not win in 100 of years. Most of his numbers came from one winning panel from Stefans system and if you know anything ALWAYS more than one panel wins. The conclusion is that Honest Ken Silvers system does not work and has no logic. A valid test Tony, of sorts. Surely if one system says a range of numbers are the ones to pick – then all systems should agree, right? Assuming they all worked. Problem is that neither of these systems are of any use – so the numbers generated by both of them are actually just as good as each other. Of course they are no less likely to win than any other set of numbers – just no more likely either. Hi, how do we know you are not related to Collard as you could just be promoting his products? Why I am suspicious of Collard is because he shows you winning slips from 2008 and these cannot be checked here as they are too old. Very convenient that he would show winning slips from a year ago, you cannot check them yourself? 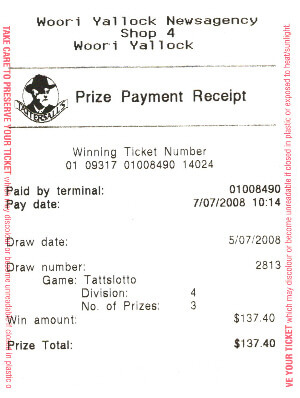 I contacted Tatts Lotto and they have all results from 2009 onwards still. So very suspicious he chooses exactly the year nobody can check??? OK, first things – Mark Collard no longer owns Win Lotto Systems (WLS). It’s now owned and sold by Prof William Foster. Mark is currently working on another lottery product which so far I’m not too excited about. If WLS was mine I’d tell you. I’m surprised Tatts Lotto were not more helpful. If you go to their main site you can download results files – the ones I checked go right back to 1981! Yes, that’s right. I work a Sydney based agency and the Tatts site is awesome for being able to download results, etc. And I’ve been using Will’s systems for years and swear by them. Sorry Alan, I’m afraid that system isn’t free to distribute – you have to buy it direct from Will if you want to use it. What are you all talking about?? The winning copies on the site shows draw date and numbers. The first ticket shows draw 2813 as being in 2008!! This draw took place in 1/4/2009?? I am not looking at winning numbers but proof of payout/dividend and draw number and I just proven it is fake?? There is no dividend payout to prove the copies on Wills site. He does not cleverly show you the numbers as this is easy to check. If Ben swears by it he has obviously not won anything significant as he would not be on here. Small wins prove nothing as I won with fast picks like this. John, draw 2813 of Tattslotto was drawn on 5th July 2008. I just confirmed that from the downloaded file direct from Tatts. The first winnings slip on Will’s site for draw 2813 is for the draw on 5th July 2008, and is paid out on 7th July 2008. So no idea where you’re getting 1/4/2009 from, but maybe double check before accusing someone of faking..! But I don’t see why you’re getting so hot and bothered by this anyway..? Will’s system is a strategy, it’s an approach to playing. It’s not one of those idiotic ‘I know the secret to beat the lottery’ guides. If you want that, buy the Lotto Black Book or something equally daft. Hi I am afraid I cannot agree on your assessment of Stefan Van De Veldes system. I have got 5/6 many times using his system this year. Prior to this never more than 4/6 in many years. The stupidest system out there is this Ken Silver guy selling dreams and I see he has many suckers subscribing to his color buttons nonsense. I hope your site helps people to stay away from this Silver (not his real name also). Which part did you disagree with? I mean it’s a fundamental fact that you cannot predict lottery games. If any lottery were even slightly predictable the lottery bosses would end up in court defending running an illegal lottery. And trust me, Stefan is not cleverer than the teams of analysts and auditors that the extremely cash rich lottery companies employ to ensure their execs don’t end up in prison! If you have managed 5 out of 6 ‘many times’ this year, then I’m pleased for you. But I guarantee you it’s got nothing to do with Stefan analyzing previous results. Hi Lottery Guy. Ken Silver emailed me this morning with a new lottery system he calls the microfiber system. He claims that by using this system you will achieve big payouts. Based on previous opinions of Ken Silver’s systems and the opinions from people that have spent their hard earned money on them, the only thing big that will be realized from the microfiber system is a big bowel movement. Have a good day. 🙂 You do make me laugh Hobbs. I bought Stefan’s Inverted system years ago and as you noted it is useless. All he does is leave out numbers from panels. So in a 6/50 game he leaves out say 8 numbers so in theory you are just playing a 6/42 lotto with million to one odds still against you. Not worth the money people. I been a sucker for many systems and won nothing but I agree only way to win is syndicate play. I would like to know which syndicates are legitimate. That is if you do ever win do they actually pay and do you know the syndicate numbers before the draw?? I understand Ken Silver runs a syndicate where people just pay but never see the numbers?? This sounds like the con of the year. I’ve personally used Big Fat Lottos and Love My Lotto. I’ve won prizes with both and been paid out. They both give you the numbers you’re playing in advance too. Like you say, I’d avoid any syndicate that doesn’t.